Home images and thoughts kitkat sleep? what sleep? Has this ever happened to you? When I was young, I used to do this a lot. Everytime my crush would call me, I would stay on the phone and pray that my Mom will not pick up the extension in her room and catch me still on the phone at the wee hours of the morning talking to a guy. When I matured (I refuse to say got older) this rarely happened until recently. Lately, I have rediscovered the joy of being able to talk to someone for long periods of time and listen to someone discuss inane things and things that matter. I have also rediscovered the art of listening to someone sing on the phone and sing along with them. It's pretty exhilarating to be honest. 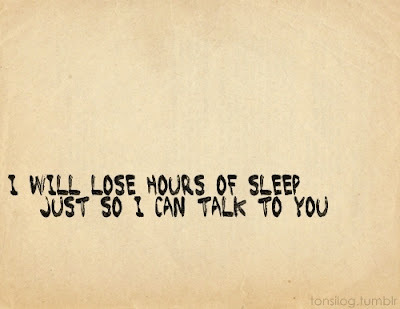 I hope that in time, I can lose more hourss of sleep just so I can talk to this person. Is it a good thing? Yes and no. Good if it progresses towards something real.